These lovely plastic koalas in three sizes (Papa koala 45mm, Mama koala 35mm and Baby koala 30mm) and four colours will motivate children to learn about colour, sorting, patterning, measurement, sequencing, number sense and more. 50 Koalas in four colours and ten cars in a plastic storage case. The ability to visualise numbers -named 'subitising'- is an important skill which children in the Prep room ought to acquire. Our 10's frames are a powerful instrument to assist pupils in developing such strong visual memory of numbers and number sense once they have acquired basic notions of counting. Ten's frames help to bring about a more sophisticated counting technique as they favour the recognition of numbers from 1 to 10 and of the relationships among said figures. 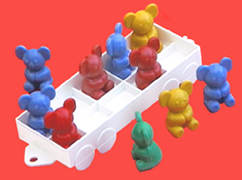 9-006 220 x Ten-frame Koala buses in a polybag. Material: polycarbonate. 50 x Small Koalas + 5 Koala buses + one spinner + instructions to play various addition and subtraction games (ideal group size 4 to 5 children) in a plastic storage case. 9-008 100 x koala cars in a polybag. Material: polycarbonate. Build and reinforce spatial reasoning, problem-solving and patterning skills with this brilliant brand new hands-on game, which has been enthusiastically received by both educators and retailers! Sudoku, sometimes spelt Su Doku, is a Japanese logic-based placement puzzle, also known as Number Place in the United States. Its aim is to enter a cypher from 1 to 9 in each cell of a 9×9 grid made up of 3×3 subgrids (called "regions"), starting with various digits given in some cells (the "givens"). Each row, column, and region must contain only one instance of each cypher. We replaced numerals with baby koalas differentiated by colour. 19 Sudoku puzzles & an answer key in a hang-sell pack. 360 Baby koalas (60 each of 6 colours, enough for 10 children or pairs), 2 sets of 19 Sudoku Puzzles and 2 answer keys in a clear storage tub. Ages 6+. 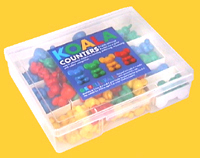 144 Large Koalas (36 each of 4 colours (36 each of 4 colours, enough for 9 pupils or pairs playing simultaneously), 9 easy Sudoku puzzles & an answer key in a clear storage tub. Ages 3+.